Born in1972 in Libya, lives and works in Hamburg. 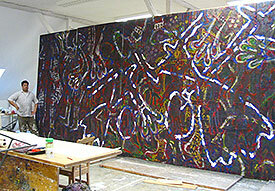 Abdulmagid Abdulrhman ih his atelier, 2007. Abdulmagid Abdulrham was born in Bene Walid in 1972. With an architecture diploma he had taken at the al-Fateh University in Tripolis he came to Germany, in 2004, for postgraduate studies of painting, graphical and visual art at the Burg Giebichstein Academy of Art and Design in Halle (Saale) with Professor Karsten Reim. After having graduated with a paper on “Die Felsenbilder und die Höhlenmalerei aus Libyen” (Rock pictures and cave painting from Libya) he did further graduate studies specializing in glass and ceramics. At the moment he’s following up the subject of rock painting for a book publication and waits for a positive decision of the Bamberg University where he hopes to continue and complete his training as an architect. 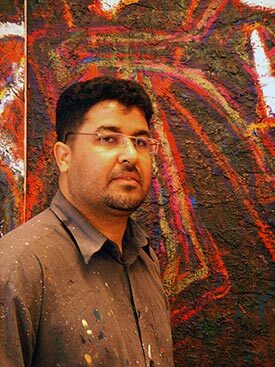 Apart from his interest in architecture Abdulmagid Abdulrham paints. As an artist he’s orientated towards rock paintings he’s encountered while traveling the area between Akkus and Egypt and which represents, for him, a part of Libyan history and culture. He expressly points out the fact that German explorer Heinrich Bart is among the discoverers of rock paintings in Libya. During his travels in Africa in 1849-1855 he discovered, at the Wade Tillizaghen in the Messak area, the “Grammatischen Apoll” (Grammatical Apollo) as he called him. Bart’s description shows the difficulties he had in interpreting him. Today, we see in Bart’s “Apollo” a mask man (probably with an antelope mask pulled over his head); the comparison with the Greek model doesn’t apply anymore. For Abdulrham, painting as an artistic form of expression and documentation as a dealing with history can hardly be separated. Rock painting, for him, is example and encouragement. The studies he’s doing and the inclusion in his work allow him to include the prehistoric art of his country of origin into his work and in this way to remind the public and the art world of it. That’s his stated objective. Archaic rock painting in Libya is about a highly developed art as each and every period has produced its artistic highlights and a stylistic canon of its own. That’s where Abdulmagid Abdulrham starts from in his work and thinking. Maybe it’s not all that coincidental that watching the Libyan artist’s works makes one think of A.R. Penck. This connection makes it plain, once again, that an artistic idea isn’t bound to neither geographic space nor a specific period, and that Abdulmagid Abdulrham’s work sorts itself into an international context.